I just love the opportunity to explain to folks that are a little new to the wonders and ways of Texas just what in the heck a Chicken Fried Steak really is. While I muster up a level of passion that no man should have for sustenance, I get into very fine details of just how a steak is fried in the style of a chicken. And then, like a child on Christmas morning with wide-eyed wondrous anticipation, I wait as the newcomer orders the famed culinary contraption off the menu of the local eatery we happen to be patronizing at the moment. "Another closed sale," I say to myself with satisfaction. And then what to my apologetic eyes should appear again but a sub-par level, deep fried, crusty, flour-coated piece of cubed cardboard beef product drenched in lumpy, wallpaper paste-modified, food-stuff packet peppered-cream-style gravy and a mound of ultra-smooth, pasty, instant mashed potatoes, with a side of green beans from a can! Oh, the humanity of it all. A gloriously creative infamous dish categorically reduced to institutional slop for a quick sale. I am on a mission to reclaim the throne for the king of Texas Cuisine -- for better or for worse -- the Chicken Fried Steak. I have this crazy idea in my head that the reason this dish is questioned for its culinary legitimacy by those who look outside the realm of its potential is the simple fact that it has mutated into the deep fried fast food creation so often found today. In the beginning, there were no deep fryers, but there were cast iron skillets. Using the good old black iron as my starting point, I am recreating and updating this dish to hopefully give it wide-ranging appeal, while preserving its culinary roots. 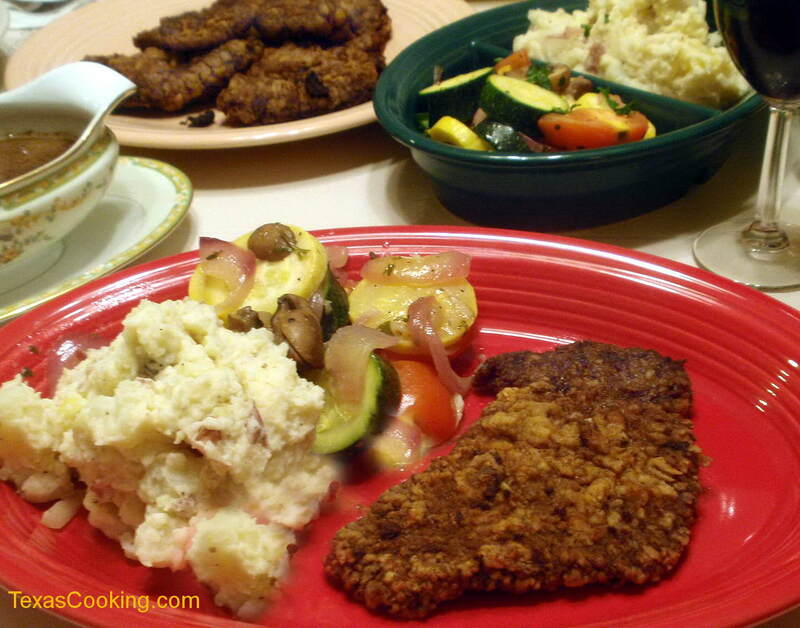 Chicken Fried Steak: Who Am I? Why is it called "Chicken Fried Steak?" Well, in the descriptive name we can find the reason for all the problems associated with the dish. It's supposed to be a piece of steak, fried in a pan in the same way that you would make real old-fashioned fried chicken. But these days, 99 percent of the restaurants selling fried chicken tend to use a deep fryer to cook the chicken. So, logically, restaurants also tend to use a deep fryer to cook a piece of beef that resembles fried chicken! So, let's not call this dish "chicken fried" any longer. The term is a little confusing. Instead, let's call it "pan fried." It's a more accurate description. So, now we're talking about have "Pan Fried Steak". Well, that sounds a little bland and non-descript, and could be anything. Let's make sure everyone knows where it's from. Why not call it something like "Texas-Style Pan Fried Steak." But what is the "steak?" Cubed steak? Well that would work, but not for our purposes here. I don't even know what cut of beef a cubed steak comes from! We need to lift this up to a new level. Let's describe a cut of steak here. Sirloin would work well, and it's inexpensive. You definitely don't want to use an expensive tender cut that would defeat the whole purpose of the dish. Who would want a chicken fried filet mignon? So we arrive finally at the properly descriptive and tempting "Texas-Style Pan Fried Sirloin." Not bad at all. So, now we need the side dishes. The classic accompaniments would be mashed potatoes, gravy, and a veggie of some sort. I like horseradish on beef, so why not a little horseradish in the mashers? If you have never tried it, give it a try. The horseradish adds a very pleasant slightly sour tang that really compliments the beef. For those that don't like horseradish, try it as well. The heat from the horseradish seems to be absorbed by the starch and is not discernable in the finished product unless you use way too much of it. Trust me; everyone seems to like it once they try it. You can't use just any old spud either. We want to use a mixture of texture and starch. I like the thin skins on some of the waxy potatoes, like red "new" potatoes and Yukon Gold potatoes. You also want to have a few small lumps to make sure everyone knows the potatoes didn't come from a box. Let's use a mixture of the familiar Idaho potatoes for their starch, red new potatoes with the skin on for their texture, and Yukon Gold potatoes for their buttery flavor. But what should we call these potatoes? Why not call this dish "Horseradish Mashed Trio of Potatoes." My mouth is already watering. Now we get to one of the most important components of this meal -- the gravy. I would consider the gravy as a side dish because it's that significant. You could almost consider it a food group in itself. Of course, when we are talking about gravy, we are talking about cream gravy. The fact that this goes against all the traditions and rules of classic European cuisine is part of what makes it so special. The French would laugh, until they tasted it! It's a rebellious combination that works very well, and part of the reason why the dish is infamous on certain levels. A thick sauce made from pan drippings and a bastardized combination of a volute and bchamel sauce, studded with a ton of black pepper. It's rich, it's creamy and oh so good! The main ingredient that makes this gravy special is the pan drippings. They are all too often forgotten in restaurant versions of this dish. For this meal, we will get it right. Because this dish is a classic "meat and potatoes" dish, many tend to treat the vegetable as an afterthought. It's so easy to turn a simple vegetable medley into something special with a little flavor, and I am going to show you a mixture of summer squash, tomato, onion and mushrooms that will enhance and compliment the main attraction. So, here's our menu: Texas-Style Pan Fried Sirloin with Creamy Pan Gravy, Horseradish Mashed Trio of Potatoes, and Summer Squash Vegetable Medley. That's quite a mouthful. On second thought why don't we just go ahead and call it "Chicken Fried Steak," and let the food do the talking, reclaiming the name for the real thing. Each of the recipes that follow makes two servings, except for the Vegetable Medley, which makes about four. If you look around at recipes for Chicken Fried Steak, then you will notice they all say to cook it in a pan. Yet in a restaurant, you almost never get a pan-fried steak. The recipe below is pretty standard. The main difference for my version is that I use breadcrumbs instead of just flour or cracker crumbs. I like all the versions, but to give a broader appeal, I am going with a very classic breading technique with the addition of a little buttermilk. Using the Top Sirloin steak makes a big difference in the texture. Choose a steak that is absent of large fatty areas, but that does have good marbling of fat. Mix together the salt, pepper, garlic, and chili powder. Season the steaks on both sides liberally. Using the hammer with the coarse spike side, pound the seasoned steaks to tenderize and work the seasoning into the meat. Be careful not to pound too thin, but you have to use enough force to actually start breaking down the fibers a little bit. Just putting a nice hammer mark on the steak won't do much. You want to make the steak a little thinner and a little larger to accomplish the tenderization process. Set up your breading station with a bowl of the flour, a bowl with the buttermilk mixed with the egg, and a bowl of breadcrumbs. Dredge the steak in the flour, coating evenly. Shake off the excess and dredge into the buttermilk/egg mixture. Now dredge the steaks in the breadcrumbs. You want to make sure the steaks are coated evenly. Set aside on a plate; you can layer between wax paper. At this point you want to have your potatoes cooking or finished, and your vegetables ready to go. See recipes below. In your cast iron skillet, heat the oil over medium heat. When the oil is hot, add your steaks. If your skillet is too small, you can cook in batches. You want to have enough oil in the pan to come a little more than half way up the side of the steaks when they are cooking. You do not want to submerge the steaks in oil. The temperature should be around 300°F. It will vary during the cooking process, but you want to maintain a temp above 250°F and no more than about 350°F. Adjust the heat as necessary while you cook. You will know if your pan is too hot if your steak starts to get too dark. You want a nice simmer happening in the pan. When you start to see juices bleeding through the top crust of the steak, it's time to turn it. About 5 minutes per side. You are looking for a nice brown color on the crust, like the color of dark wood, but not the color of chocolate. You should turn your steaks only once. When both sides are done, remove from the pan and drain on a brown paper bag or towel. Keep them in a warm oven until the gravy and everything else is ready to go. There is a term in classic French cooking called "fond." This term describes the browned caramelized concentrated residue that remains in the pan after something has been cooked. The fond is what you are after when you "deglaze" a pan. It's what adds richness to any pan sauce. And fond is what's missing in most restaurant versions of cream gravy. This version is a little different in that it also has chicken stock, and a little wine. Using the pan you just fried your steaks in, drain off all the oil into a container and measure out 2 tablespoons of the oil, returning it to the pan. Turn up the heat a little to medium-high. Add the flour and cook for a few moments until a paste is formed, making sure there are no lumps in the flour. Add the wine and the chicken stock. Use a whisk to quickly incorporate the flour mixture into the liquid, ensuring there are no lumps. Bring up to a simmer. The gravy will get very thick at this point. Scrape the bottom of the pan with a wooden spoon to get all the fond incorporated into the gravy. Add the half-and-half a little at a time, until the desired consistency is achieved. You want a thick sauce, but not a paste. Finish with the salt and the black pepper, adjusting seasoning to taste. Don't be shy with the gravy when you serve the steak. You want enough to get a good amount with every bite. Make a "gravy well" in the potatoes, and have any leftover gravy available on the side in a gravy boat. The combination of potatoes in this dish adds dimensions of texture and flavor. Don't be afraid of the horseradish. Start with a little and add more to your liking. Peel the Idaho and leave the skins on the other potatoes. Cut into large chunks and boil in water until tender. Check with a fork. Drain well and add the remaining ingredients, holding off on the half-and-half. Mash with a hand masher until nice and smooth. Adjust consistency with the half-and-half. Adjust seasoning with salt and pepper. You can make these potatoes ahead and hold them in a covered ovenproof container in a warm oven while you fry your steaks and make the vegetables. This is a quick and very flavorful vegetable medley to complement your meal. Fresh vegetables make you feel a little better about eating this kind of main dish, so you might as well have a good tasting vegetable. This recipe makes about four servings so you will have leftovers that reheat in the microwave nicely. Heat the oil in a sauté pan over medium-high heat. Add the onion and sauté for a few minutes. Add the mushrooms and sauté until the onions are soft and the mushrooms shrink a little. Add the remaining ingredients and sauté until the squash is tender-crisp. Check seasoning and add salt and pepper to taste. You can make this while your gravy is simmering. That's it. The only thing missing is a heap of buttermilk biscuits or skillet cornbread to go with it all. Once you try the real thing, you will never look at the other version the same way again. A final note for any restaurant chefs out there reading this: Try making your Chicken Fried Steaks at the sauté station instead of the fry station. You can use the same product you use now. Just pan fry instead of deep fry. For the pan gravy you can deglaze the pan with a touch of wine, and then finish with the same cream gravy you use now. I guarantee you will see positive results and more importantly, repeat customers.